Calogero Presti was born in 1989 in Sicily. He studied at the 'Accademia Nazionale di S. Cecilia' in Rome with Alessandro Carbonare and at the Scuola di Musica di Fiesole. Then he studied at the Hochschule für Musik in Basel with François Benda, where he graduated from the Master Performance and as well the Master Soloist in 2015 with distinction. 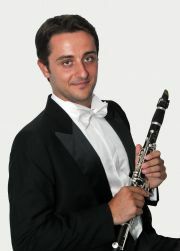 Calogero Presti has won numerous national and international competitions, among the others the 'Marco Fiorindo' Clarinet Competition in Turin and the international clarinet competitions ‘’Saverio Mercadante '' and '' Giacomo Mensi ''. He is also a winner prize of the Marianne and Curt Dienemann Foundation, the Fondation Nicati de Luze and the Rahn Kulturfonds. He played with prestigious orchestras, among others the Orchestra Nazionale di Santa Cecilia, Orchestra Mozart, Orchestra Regionale Toscana, Basel Symphony Orchestra, Orchestre Symphonique de Bretagne, the Netherlands Symphony Orchestra and the Gustav Mahler Jugendorchester , World Youth Orchestra and the Orchestra Giovanile Italiana di Fiesole. Calogero Presti has worked with famous conductors such as Claudio Abbado, Daniele Gatti, Riccardo Muti, Christoph Eschenbach, Gabriele Ferro, Vladimir Yurovsky, Gianandrea Noseda, John Axelrod, Mario Venzago and Stanislaw Skrowaczewksi and has participated in many music festivals.